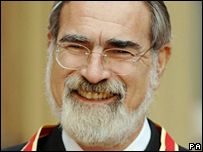 Anti-Semitism is spreading around the world in a kind of tsunami effect, says Chief Rabbi Sir Jonathan Sacks. Globalisation had led some people to wrongly see Israel as the cause of all the world's conflicts, he told BBC Radio 4's Sunday Programme. Holocaust denial and hatred of Jews were circulating widely in best-selling books and prime time TV, he warned. Islamic militants have used Israel's treatment of Palestinians to rally support for their violent campaigns. The chief rabbi however, pointed out that wars in Chechnya, the Philippines and Indonesia would be happening even if Israel did not exist. He said conflicts around the globe had begun to have uncomfortable repercussions for some Jewish communities in Europe, the chief rabbi claimed. "This is all a kind of tsunami of anti-Semitism which is taking place a long way from this country but (of) which Europe seems unaware," he said. He said that while the Jewish experience of Britain was generally good, British Jews were experiencing a globalised anti-Semitism through satellite television, e-mails and the internet. He claimed anti-Jewish feeling was on the rise in European countries such as France. "A number of rabbinical colleagues throughout Europe have been assaulted and attacked on the streets. "We've had synagogues desecrated. We've had Jewish schools burn to the ground - not here but in France." Figures from the UK-based Community Security Trust, which monitors anti-Semitic incidents and advises the Jewish community on such matters, said it had seen a huge rise in incidents last year. Some 532 anti-Semitic incidents were recorded by the trust in 2004, 83 of which were physical assaults. Sir Jonathan added that he was concerned that more was not being done to change attitudes. However, in a letter from the Joint Council of Christian and Jews signed by Sir Jonathan, he acknowledges the role the Middle East conflict plays in boosting anti-Semitism. The statement from January 2004 read: "Achieving peace, justice and reconciliation in the Holy Land would help to make it harder for anti-Semitism to flourish."